Google announced today that they're discontinuing Google Reader (sadface) & it will take effect on July 1st, 2013 -- though I'm sure you already knew that because it's been popping up in my subscriptions all day. Regardless, if you don't even know what Google Reader is, you can ignore this post because it won't affect you. Though you may want to skim through in case you're looking for a new platform to catch up on your blog reading. When I first started reading blogs, Google Reader, albeit an archaic platform, was where I collected all the pretty blogs I liked to read. I'll be sad to see it go. This is what I've been using the most lately. It's a great RSS feed site. It has a pretty interface, like reading a blog of blogs, and it works with your favourite browsers (Safari, Chrome, Firefox). They also make it really easy to share or save a post you really like, and you can also connect Feedly to twitter / facebook to get updates on the main page. You can also download the Feedly App for your mobile devices. 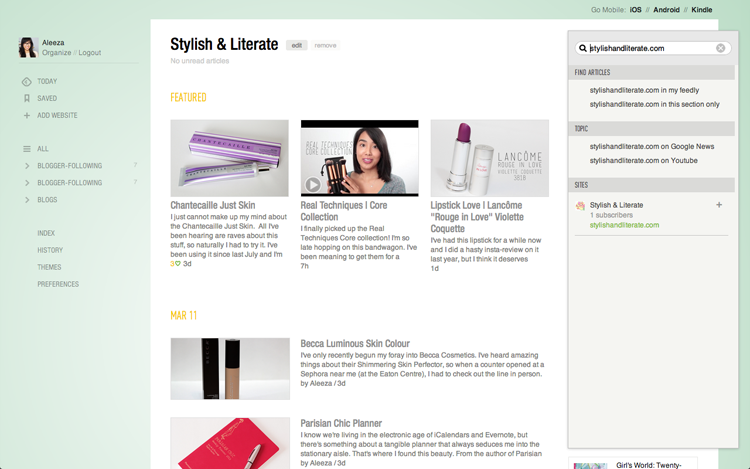 You can add my blog to Feedly by searching "stylishandliterate.com" :). It's also a breeze to import your Google reads (click here for more info on how). Another great interface to follow your favourite blogs. It's easy to follow bloggers, like posts, and view popular posts / top blogs to find new sites you may not have heard of before. Blog owners can create their own "profile" and track their blog ratings & followers. 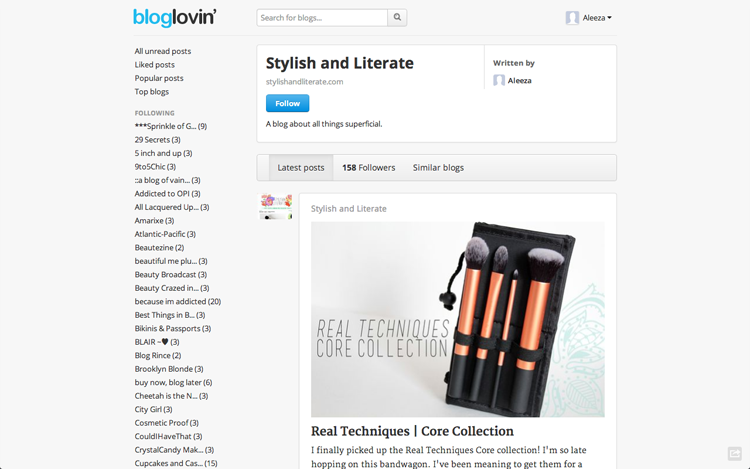 Blog Lovin' also has an App for mobile devices. 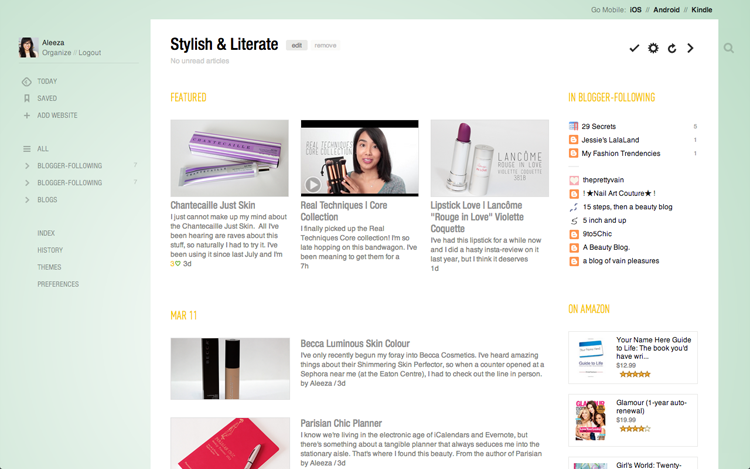 They also make it really easy to import your Google Reads to Blog Lovin' (click here to see how). Follow my blog on Blog Lovin'. This is a new site that I joined a few months ago. It's more than a place to read your favourite blogs, it's like a community. 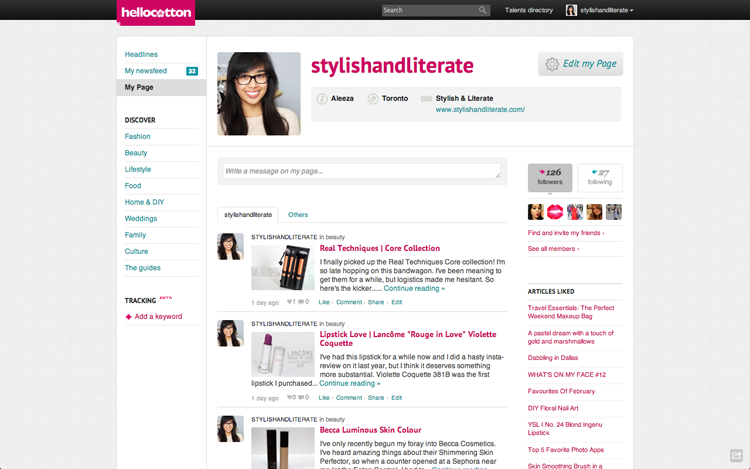 You can follow blogs, like posts, and even leave comments on the Hello Cotton platform. They also feature new posts every Monday to Friday so you can discover new bloggers from many different categories. Follow my blog on Hello Cotton. EDIT: On March 29, 2013, Hello Cotton announced that they will (unfortunately) be shutting down the website :(. And, of course, you can always follow my blog through my RSS feed & via email (see the sidebar to sign up). I just recently came across another RSS reader called The Old Reader. The interface is quite simple, akin to the look of Google Reader. So, if you're interested in transitioning to something you're more familiar with.. this is definitely a good alternative. It's also quite easy to import all your subscriptions from Google Reader. Thanks for this post! I had never heard of Feebly before, so I am looking forward to starting to use it!